Yet another access road planned for PennEast. This one goes from Pleasant Valley Road onto their site on Baldpate Mountain. The access road is the dark grey path on the upper left of the map snaking up to the pipeline construction area. As you can see, the proposed access road goes up the side of the mountain and then back down to get to the pipeline construction area. This is the second steepest slope on Baldpate that I can see, and PennEast seems to have made it deliberately as awful as possible. You can see all of those construction work spaces digging into the existing old growth trees, and then the helpful access road to make it even worse. As a final note, I’ll show what Fairfax Hutter dubbed the Baldpate “Mohawk”. The so called “colocation”, that really isn’t. 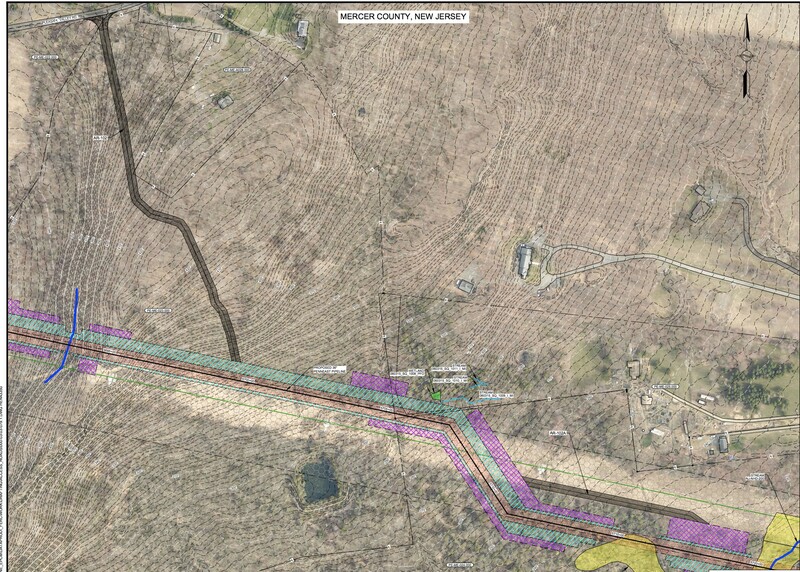 In this case, the pipeline has to be sited far enough from the high voltage lines that the construction is in an entirely new corridor on Baldpate, with a thin area of trees between the power lines and PennEast e.g. the Mohawk. My son might think this is cool, but pretty much everyone else is going to hate this.